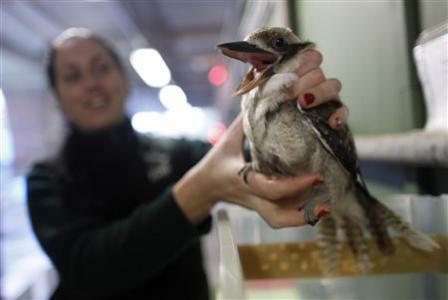 While she’s not a pudgy budgy, there’s one roly-poly little kookaburra in Australia that has suddenly gone from living the high life and chowing down on sausages to working out three times a day with a personal trainer, eating diet food, and living in a bird-style gymnasium. The bird was too fat to fly, thanks to people feeding her sausages and other people food at barbecues in a park in Sydney, Australia. She was a hefty 1.2 pounds, 40 percent heavier than a bird her size should have been. She’s not going to be a permanent resident of the zoo. She’ll be returned to fitness, then returned to the wild once she’s able to fend for herself. Concerned Aussies turned the bird over to the zoo after noticing that she was being chased around by dogs, unable to escape. Now she’s doing “Extreme Makeover, Zoo Edition” and dropping those excess 6 ounces!